In today's post, we'll share our recipe for a popular item that the children love at Thanksgiving school parties - Mini Cornbread Muffins! Not only do the children love them, but the teachers love that the tiny muffins are not too messy. 2. Whisk the egg, milk, and vegetable oil until well blended. 3. Add the cornmeal and stir until thoroughly mixed. 4. Slowly add the all-purpose flour and stir until thoroughly mixed. 5. Add the sugar, baking powder, and salt. Stir until thoroughly mixed. 6. Bake for approximately 15 minutes or until golden brown and a toothpick comes out clean. That is such a handy little carrying case for them! I bet my kids would love to have these mini muffins. I want to get one of these because I have been using a casserole pan to transport cupcakes which is not the best way to transport treats to school. This would be really nice and wouldn't mess up frosting. That is such a cool container. I think it would be extra helpful for parties when brining mini cupcakes so that the frosting stays in place. I really want a Party Serving Kit. It would be so handy for birthday party cupcakes at my son's school. These are perfect for the holiday season! Thank you for sharing. These are one of my favorite muffins, no matter what day it is! In mini form they are even better! I love that case!! We are always making mini muffins they are the kids favorites. That is a fantastic container! I am always looking for a good way to transport my deviled eggs. That would come in incredibly handy for school parties! And I am a huge fan of corn muffins! Oh my goodness, these are just perfect for our church Thanksgiving. And I love that carrying case. Super-cute. Thanks for sharing. I do this all the time for the boydhild but I've never thought about doing muffins. That would be a pleasant surprise. We love cornbread muffins. Sounds amazing & that carrier would be great for the holidays. My family really enjoys cornbread. 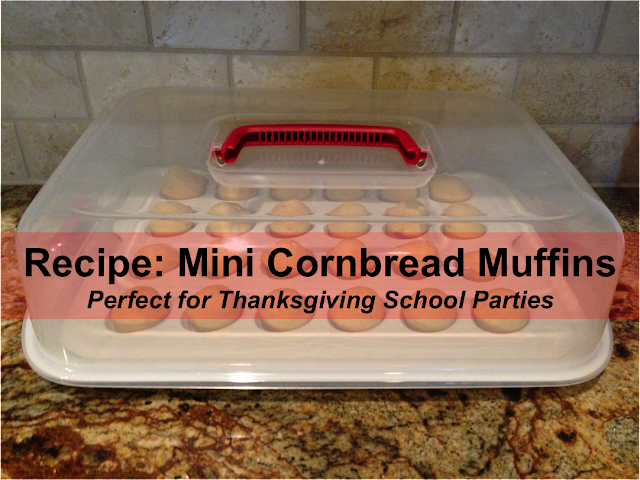 That Rubbermaid container looks perfect for carrying mini cornbread muffins or even cupcakes to school for a Thanksgiving feast or kids birthday party. I love that carry container! That would make things so easy to transport.I have to buy one!